Every boat needs a compass even for basic navigation, but with the increased use of GPS and chart plotters with integral heading displays we tend to use the compass less and less. Traditional magnetic compasses are reliable, but have to be compensated for Variation and Deviation. My boat had been fitted with a Ritchie magnetic compass from new, but despite adjustment it was often 30 degrees off. So far, it has proved to be exactly as expected. It is exceptionally easy to install, in fact you don’t have to be precise with the alignment as you can make a digital adjustment so the readings are accurate. You don’t even need to calibrate it, it calibrates itself. You can “force” a calibration by steering a double circle, slowly, but that is all you have to do. If for any reason you can’t fit it directly in front of the steering position aligned fore-and-aft in the traditional way, you can mount it offset to one side, facing the helm, and adjust the display angle offset as above. A simple button allows you to set a course to steer, and it displays an “off course” bar to help you stay on line. If the claimed accuracy of 1 degree causes too much display change, you have a number of different damping levels to cope with different sea conditions. There are five wires to connect: power (+ and -), light (so you can include it in the instrument light switch), and the two NMEA 0183 output wires (+ and -) to connect to your plotter or radar, if you wish. 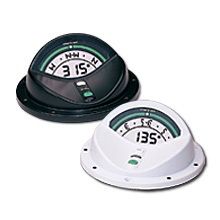 The Azimuth 1000 is available in black or white, to suit your dashboard scheme! The KVH website is very informative, even the owner’s manual is available on-line. The only problem is the UK price – around a staggering £420 from many UK chandlers, but only $250 when bought in the USA. You can guess where I bought it. The compass performed very well. Initially it was registering nearly 20 degrees off the heading shown on the plotter, but after the self-calibration exercise it was showing only a 4 degree difference. As this was a constant on every heading, I assumed this to be because the compass itself was not perfectly aligned – difficult to do without a reliable point of reference on the boat. I had used a bulkhead as the alignment aid but that could easily have been 4 degrees off. The simple solution is to enter the Configuration mode and put in a reading offset of +4. Result – an accurate compass! The connection to the plotter to send heading data was equally simply – now the vessel image on the plotter shows the true heading, which is very useful at low speeds.